Inverters, Frequency Inverters, Inverter Drive, Frequency Converter, Adjustable Speed drive, no matter what you call them they all refer to the same device. 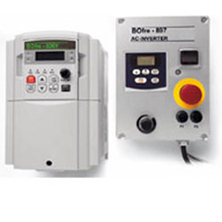 Inverters vary the frequency of a motor and adjust the voltage creating variable output speeds. Inverters are paired to motors based on the amperage of the motor and the AC supply voltage. Inverters are available in multiple levels of intelligence and enclosures (IP20-NEMA4X) to accommodate a wide range of applications. Whether you need basic functionality to just start /stop/forward/reverse… or more complex applications requiring communication protocols, encoder/resolver feedback, or harsh environments. Other options include cold plate, push through and water cooled. Numerous protocols for communication are available. Some of the most common are DeviceNet, Interbus, CanBus, Sercos, Profibus, EtherCAT, EtherNet/IP, Powerlink. The previous protocols are in no way complete as new protocols come to the market regularly. Ability & Drive can assist in determining the best inverter for your application.